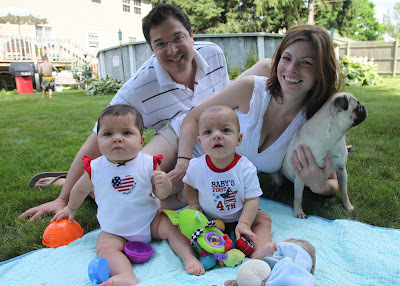 The twins, Billy and I went to Penny and Ned's first birthday party this weekend. Fun was had by all, the birthday boy and girl were cute as could be, and Sebastian and Collette discovered a new food - watermelon. Sebastian was fussing (shocking! I know...) so I decided to calm him with food - don't worry, I've taken my name off Mom-of-the-Year Ballot. Between cookies, brownies, cupcakes, hot dogs and fruit salad, I figured I should go with fruit salad - more of the junk food left for me! As it turns out, watermelon is a terrific finger food for my kids. When they hold things, they tend to squeeze them really hard so foods like banana and avocado won't work as finger food. Well, watermelon is quite fibrous and doesn't yield much when grasped by a baby hand. However, the babies can still bite and chew the watermelon, even without teeth. Finding more finger foods has been a goal of mine lately so I was pretty excited with this discovery. Lucky for me, watermelon is very much in season and I picked one up at the grocery store. $5 each - regardless of the size. Naturally, I picked the biggest one I could find. And because it was so enormous, I made Billy chop it up - HOLY SH!T. I have enough watermelon to feed the twins until Christmas. I have some in the fridge and three very large, very full freezer bags in the freezer. And of course, I don't even like watermelon. Figures. On that note, any other finger food suggestions? My biggest issues are things that are too small for Sebastian to pick up (for example: he is really bad with Cheerios) and things that are too squishy. I have used the "roll it in some cereal dust" idea and this has helped but does not turn a squishy food into a non-squishy food. Big winners so far (in addition to watermelon) are bagels, croissants, sweet potato fries (when I don't burn them), Arrowroot biscuits, Club crackers and strawberry quarters. Note the overabundance of carbs on this list. Sorry, Dr. Atkins. Yes, I have officially said good-bye to my beloved Medela Pump'N'Style Advanced breast pump and parting is such sweet sorrow. My last pump was Wednesday night and it wasn't until yesterday (Friday) that I started to feel uncomfortable. I've been forced to sleep on my back (I'm a tummy sleeper) which is all too reminiscent of my c-section recovery - bleh. But soon enough I'll deflate (I will, right??) and all will be right in the world. And this is the last you have to hear about my weaning. Promise to get back to good stuff, like cute things 9 month olds do, and the like. I'm down to pumping twice and day and soon will only be pumping once. I'm getting about 16 ounces a day now, less than a third of where I was before I started weaning. So, lots of good progress in 10 days. I'm thinking my goal of being done by August 31st is pretty attainable although I'm sure it will come with it's fair share of discomfort. A friend (thanks Tanya!!) has hooked me up with some free formula so we have started with that since my supply is well below what the twins drink in a day. I was all worried that they would hate the formula or have upset tummies or constipation, but no. They're fine. Like there was no change at all. Of course I'm glad that they are transitioning well but there is this part of me that wished they cared, or maybe even noticed, that this is not mommy's milk. On the flip side, I have lots more spare time with less pumping and less cleaning of pump parts. This will also give me a bit more flexibility with being out during the day. I think that the twins could withstand a bit of disruption to their nap schedule every once in a while. Maybe Grammy and I can plan a fun day trip with S and C - suggestions?? It seems that while I was all worried about crawling and rolling over, I should have been worried about language development. We had an EI evaluation on Thursday and both Collette and Sebastian qualified for services based on their inability to imitate. Whoops! I was a little sad at first, like I had failed them in some way, but then I realized that only good things can come from this. We get an expert in development to see ours kids every week. So, whenever Billy or I have a question or concern, we have someone to ask! Also, our kids will get to partake in their play groups, so that will be another activity for us to do during the week, with a specialist and chances to meet other moms and their babies. My only reservation is that this might lead us on a slippery slope of intervening whenever something is not up to par. Not everyone can be at or above average at everything, all the time and I don't want us to expect that of our children. I do not get the feeling that EI operates that way but, as parents, it's easy to let your thinking go down that road. So, fellow moms: Anything I should know about EI? What to expect at our meetings and play groups? Is it me, or does 9 months sound like a lot?? Maybe its because that's how long you're supposed to be pregnant, so now they're finally longer out than in? Although, my babies passed that mark over a month ago, but still. I guess anything at this point is going to seem like a big milestone, just getting us closer and closer to the one year mark. This ninth month of life for Sebastian and Collette has meant introducing finger food, saying good-bye to many of their favorite toys (play mat, bouncy seats, bumbos...), new car seats and, most recently, mobility. We have brought in some new toys that have become favorites, most of which light up, make noise and involve a ball. Peek-a-boo is also a big hit, again, and thankfully does not require batteries. Just a willing adult. Sebastian is crawling all over the place but this has not dampened his fussiness. He is starting to pull up and can get on his knees but not his feet just yet. He is still working on picking up small bits of food (mainly Cheerios and Rice Krispies) but gets easily frustrated when it doesn't result in actual eating. He much prefers bigger snacks like crackers and bagels. Collette is all about the finer things. She LOVES to eat Cheerios and can grab one at a time and get them in her mouth, most of the time. The dog is still eating well, though. She wants to crawl but doesn't tolerate being on her belly for very long. She has been saying "mamamama" and "babababa" - not really words (says spell check) but getting close. Happy 9 months, Collette and Sebastian. Billy got his green card yesterday! Hurrah!! We had to go into Boston for the interview and, as is life, there was no shortage of hassle. You have to go through security to enter the building, much like an airport except they let you keep your shoes on. We had decided to bring the babies with us since we figured there is no better proof of our relationship than them. With the two of us, it wasn't too bad getting everything and everyone through. Once we made our way to the appropriate room and Billy got in line, the fire alarm went off and the building went on lock down. Everyone was evacuated. As luck would have it, the exit next to us was no handicap accessible (read as: not stroller accessible) so I had to go all the to the other end (where we came in) and go out that way. After 15 minutes outside, on the hottest day of the year, they let us back in. Only now I was alone (Billy had to stay in line by the other exit) and had to carry two babies through security, while people stared at me like I nuts. In their defense, it would have been a little nutty to plan to do this alone. The interview went well, the babies (mostly) behaved and the nice immigration officer approved Billy's green card request. So, he is now a resident. Not an American citizen but close. I'm thinking of making one of those American flag cakes. Billy may take offense, though, which kinda makes me want it even more. Now we just have to get the babies their dual citizenship in El Salvador and we will be done with government forms and meetings and the like for many years. PS - the woman who manned the desk at the immigration interview room looked exactly like the Crypt Keeper. No lie. And she acted like she might be part dead, too. Do you ever think that just maybe, certain people are simply unemployable? And that the government finds all those people and gives them jobs? I kinda feel bad for those government workers who are actually good at their jobs. These zombie people are totally giving them a bad rap. I know this is not such a fun topic but I just want to have a record of how it all went down. I have been trying to research weaning from the pump but have not had success. There is so little info out there on exclusively pumping and even less on how to stop! So, today is day 4 of weaning. I was going to drop to 4 pumps but, based on the timing, it made more sense to go down to 4. So, I pump when I wake up, during the twins' second nap and lastly before I go to sleep at night. I try not to pump any more than 15 minutes so that I don't empty all the way but its hard - it doesn't feel right to stop when you still have that fullness. My production has decreased but not by much yet. Yesterday, I think I produced around 45-48 oz, down from 54. I feel like its going to be really painful to drop that midday pump. Not sure when I should drop it. I think when I get down to around 30 oz I can drop to 2 pumps without getting too engorged. I have a history of plugged ducts and have had to do some mini-in-between pumps the past couple days so that it doesn't get out of hand. I read that sage tea helps decrease milk production, as well as peppermint and cabbage leaves in the bra (thanks, Sadia!!). Beyond that, I'm not sure what else I can do. This seems to be harder than increasing supply - go figure! My goal is to be done by the end of the month - I'm not sure if that is realistic. I also don't know how long it will be before I get my dear friend back, if you know what I mean. Another goal over which I have no control. I have decided to stop pumping. There. Variety of reasons but everyone is happy. So far. I have been pumping 5 times a day and today I will drop down to 4. Not sure how long it will take overall. If you have tips/advice/warnings, I'd gladly accept them. FavAuntie made me post this! And I promised I would, so here is a video of Sebastian crawling. Beware, it's the worst video quality since they invented video recording. 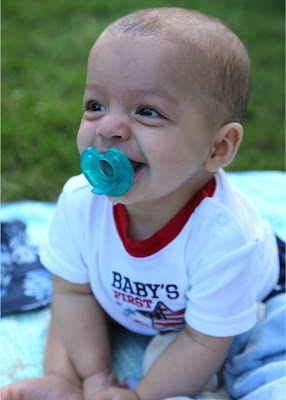 My cousin's girlfriend, Rachel, is a freelance photographer and got to take lots of pictures of the babies (and mommy and daddy!) 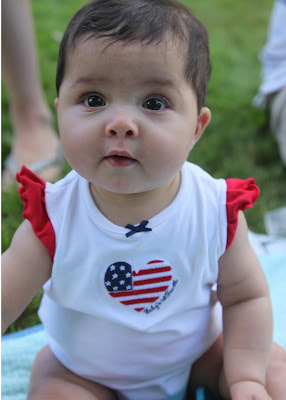 at our family's 4th of July cook out. Colie looks pissed and of course the dog isn't cooperating but I'm so glad to have a nice picture of all 5 of us! More flashbacks can be found at Twinfatuation! I think I have a communication problem. Again, I am putting my foot in my mouth when it comes to talking to singleton moms. Maybe it's not me, but I'm starting to think it must be. Here is what happened at the indoor play space yesterday. Me: Um, no. They're ours. Singleton mom walked away. And that was that. Later, as we were packing up the babies and lifting our behemoth strollers over the gate to play room (of course, the stroller did not fit through the gate opening and we needed them for feeding...sigh...), I noticed an umbrella stroller next to the gate. Clearly, she did not understand that I was envious of her bite-size, feather weight stroller, perfect to fit one stroller bound child. She instead thought I was showing off with my big, fancy, can't-fit-through-aisles-or-baby-gates-and-takes-Herculean-strength-to-lift double stroller. Ya, you all want to be me - I know. Back at Cheryl's for Makes My Monday!! First, check out my post at How Does YOUR Garden Grow and see my inner Julia Child! Other than cooking up summer veggies, I have big news that is making my Monday. (drum roll...) Sebastian is CRAWLING!! Hurrah! I don't have a video of it yet because I'm an awful 21st century mom but I will get one before the end of the week. He isn't ready for a diaper commercial yet because he uses one knee one one foot to make forward progress instead of both knees. But he is kind of doing the left-right-left-right motion instead of just scooting forward inch worm style. And he shows very early signs of pulling up so I need to get the whole "child-proofing" thing. He is partial to electronics and their cords so I have to be a lot more careful and keep those things out of reach. More work for me but I'm happy that we are making progress! In less exciting news, both babies can feed themselves their whole bottles, reliably so. This morning was the first morning (first time, actually) they both fed themselves. I hovered next to them while reading a book. Does life get better? Lately, I have been getting the feeling that children "misbehave" more when other people are around. I'm not sure if this is just coincidence or if they are simply seeking attention. Not sure if they are seeking my attention or just any adult. For example, all week, my sister (Auntie Kim) has been staying with me. She still has to go to work but is home by 3:30 so she spends a nice chunk of time with the twins. And all week, they have been so cranky. I was dreading today, knowing that once she left to go to work this morning, I would be on my own with two 8 month olds who seem to hate life. But today, they have been happy angels. Maybe they are taking pity on me. Maybe they are as sick of hearing themselves whine as I am. Or maybe the gods have intervened so that I don't resign as their mother and give them up for adoption. Baby's first ride in a shopping cart, times 2! Baby's new car seat, times 2! Baby's first backyard pool, times 2! Collette is pretty pissed in this one but that was the day she got sick so I'll say that's why she got so mad and not because we made her go in the pool. A rash, swollen foot and fever of 103 degrees landed little Miss Collette in the ER on Sunday afternoon. This is the first real illness (more than just sniffles) that we have had with either baby and we are lucky that it wasn't anything serious. Apparently, it's just a run-of-the-mill viral infection and will be all gone in a day or so. I gotta say though, it was weird doing something (even if it was a trip to the ER) with just one kid. Billy stayed home with Sebastian while I packed up Colie. Of course, we don't have a single stroller, even though I have been advised to get one, just in case - should have listened to you, Mommy Esq.! The valet at the hospital took my car away once I got baby, stroller, purse and diaper bag out of the car. When I tried to put Collette in the stroller she screamed bloody murder so I had to carry her into the waiting room, while holding two bags and pushing an empty double stroller. I looked like such a fool. But despite the weird looks I got for pushing the empty double stroller, no one paid us much attention. Not one person came up to me to comment on Collette, tell me how cute she is, ask me how old she is or how big she is. A mommy with her (one) baby daughter just isn't so interesting, I guess. A dime a dozen. This must be how it is for singleton moms when they go to the market or the mall. No one stopping them to repeat some cliche or bombarding them with questions. It surprised me at first but then it was kind of nice to not have worry about strangers and just focus on my kid. Collette is fine and almost 100% back to normal. And she was nice enough to spare her brother - he only got a very slight fever and no rash or swelling.